Cold Spring Public Library is giving away lots of prizes this summer! 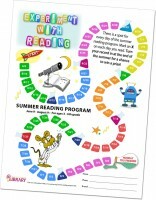 We have weekly prizes to give away to children and teens registered for the Summer Reading Program, which begins June 9. When you register at the library, fill out a drawing slip with your name. Children can win a Kindle, so bring in your reading record no later than Aug. 16. Teens can win an iTunes gift card and a Kindle, too. Thanks go to the Cold Spring Friends of the Library for donating these fabulous prizes.